Define a goal —Before you begin a video marketing campaign you MUST determine the specific goal. This goal should be measurable. Of course, video marketing is only one part of your overall marketing strategy so pinpointing the videos exact role in achieving this goal, will be impossible to pinpoint, but having a measurable goal will allow you to better measure your results. Determine your target audience — You need to know who your target audience is and where to best reach them. Identify a your key metrics — Your key metrics can be determined by your video’s role in your sales funnel. To get results, your video marketing strategy should directly allign with your sales funnel. Because of its visual format and the popularity of online video in social media, video marketing can be very effective in raising brand awareness. Although it’s a common video goal, it can be hard to track. Likes, shares, comments, conversations, etc. 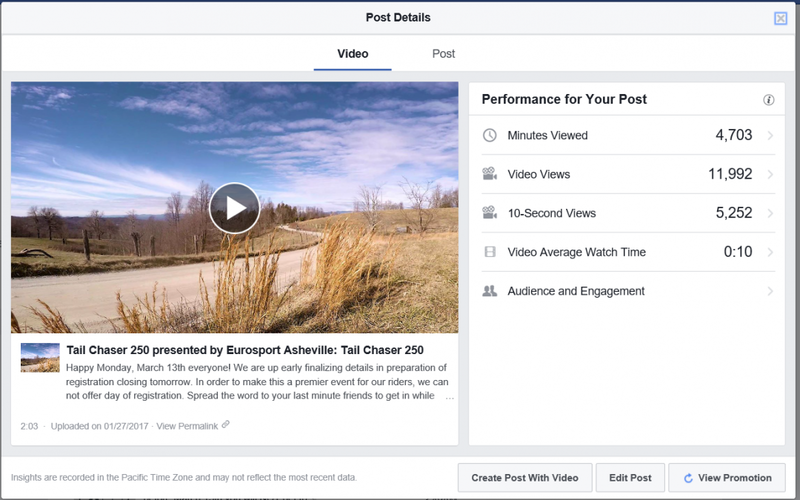 One way to measure brand awareness is to track engagement on video likes and shares. Video views. This can reveal how the video performed in relation to other pieces of content. Major social media platforms such as Facebook, Twitter, and YouTube provide tools for seeing metrics such as video views, likes, reach, watch time, and engagement. Here’s an example from our own social media marketing. We chose to boost this post to hit a wide target audience. Goal: To raise brand awareness. 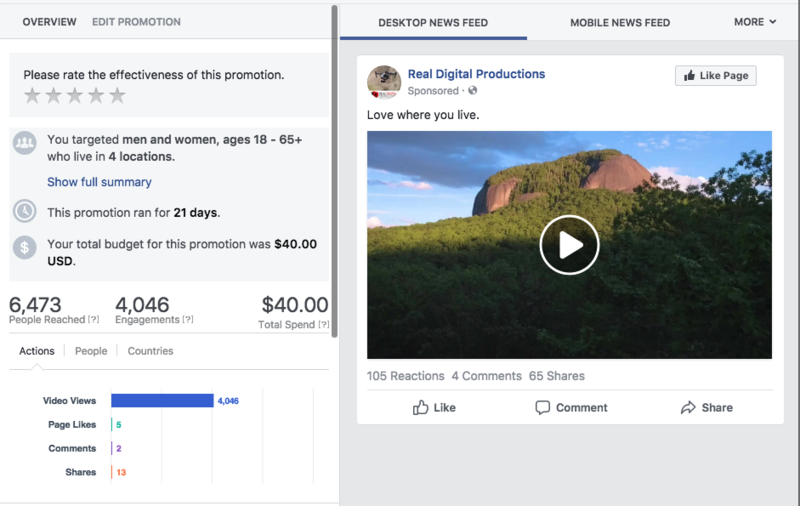 Target Audience: Wide (18-65+) around Brevard, NC Key Metrics: Views, likes, and shares Success? Yes! Over 4,000 views, 105 reactions, and 65 shares. 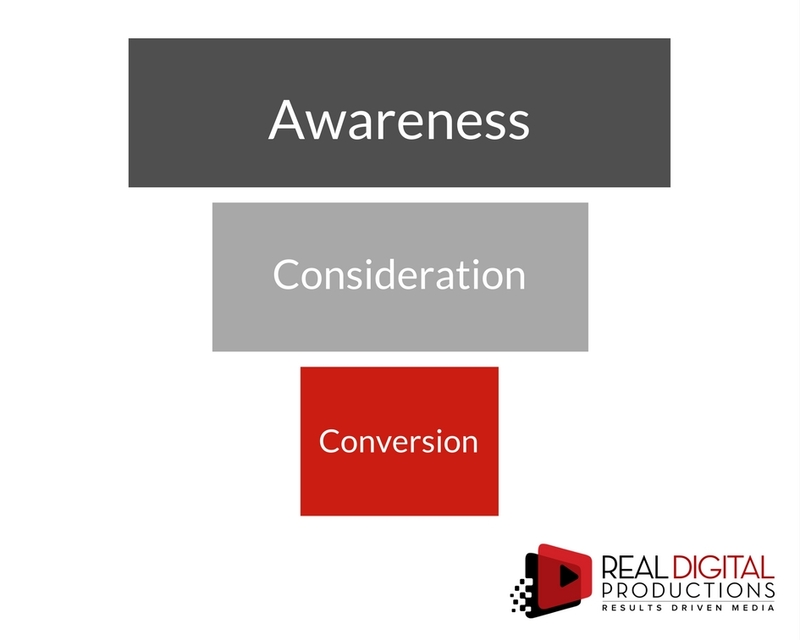 In this stage of the sales funnel building trust, establishing credibility, and converying company values are common goals for your video marketing. Based out your business’ needs, you may choose to create how-to videos, product videos, FAQ videos, employee profile videos to help explain your business to people and demonstrate reasons to choose your business over your competition. When measured properly, you can gain great insight into how to continue optimizing your video strategy. What to Measure Site metrics. Again, metrics on the web page where your video is being watched are important for getting an idea of content relevance or resonance among viewers. Length of viewership is also important. So be sure to track when viewership drops off on your videos. How to Measure Google Analytics provides comprehensive site metrics, while tracking your customer communications can offer insight on video impact. Profile videos can be a great way to build brand value – especially in businesses where “trust in your brand” is a major selling point. Use Google analytics to track the viewing habits of potential customers. 3. Conversion Stage At this stage, an effective use of video is providing reasons why potential customers should do business with you. Don’t forget to use some form of a call-to-action. What to measure: Conversions. This one is the most obvious: conversions that resulted from your video will reveal its performance as a whole. That conversion could take the form of a contact form submission, newsletter subscription, or purchase, depending on your specific goal. Video actions (clicks, views, retention). Did you use a clickable call-to-action on your video? Or did you share your video on a social platform where you can track video views and retention? These metrics help give you an idea of whether or not the video content is relevant to your audience. Site metrics (traffic, bounce rate, time spent on landing page). If your lead generation goal is to get viewers to visit your website to complete an action, then it is important to know whether or not your video has created an impact on website traffic. If website traffic has increased following a video publication, are people bouncing from the page or staying enough time to indicate interest in your business? How to measure May of these can be measured with Google analytics, but do not underestimate the power in anecdotal feedback. Focus groups, surveys, etc. can lead to valuable insight in to the effectiveness of your marketing. Example: We followed up with Chad Banner after we completed his Tail Chaser Event video to learn how effective his video was in increasing registration. Upon the release of his video, registration doubled. Here’s a peek in to the results of his video. With almost 12,000 views it’s obvious this video was successful at raising brand awareness. From our interview with Chad, we realized that his video was also successful at conversion with event registration doubling soon after release of the video. Chad’s Testimonial Video – How Effective is Video Marketing for Events? 3. Conversion Stage At this stage, an effective use of video is to provide reasons why potential customers should do business with you. Don’t forget to use some form of a call-to-action. What to measure: Conversions. This one is the most obvious: conversions that resulted from your video will reveal its performance as a whole. That conversion could take the form of a contact form submission, newsletter subscription, or purchase, depending on your specific goal. Video actions (clicks, views, retention). Did you use a clickable call-to-action on your video? Or did you share your video on a social platform where you can track video views and retention? These metrics help give you an idea of whether or not the video content is relevant to your audience. Site metrics (traffic, bounce rate, time spent on landing page). If your lead generation goal is to get viewers to visit your website to complete an action, then it is important to know whether or not your video has created an impact on website traffic. If website traffic has increased following a video publication, are people bouncing from the page or staying enough time to indicate interest in your business? How to measure May of these can be measured with Google analytics, but do not underestimate the power in anecdotal feedback. Focus groups, surveys, etc. can lead to valuable insight in to the effectiveness of your marketing. Example: We followed up with Chad Banner after we completed his Tail Chaser Event video to learn how effective his video was in increasing registration. Upon the release of his video, registration doubled. Here’s a peek in to the results of his video. With almost 12,000 views it’s obvious this video was successful at raising brand awareness.